There are many ways to come and study at Hokkaido JaLS, and we will support you in every way possible at every step. The following information is a summary of details found on the Japanese Ministry of Foreign Affairs Website, and we also advise that you check out http://www.mofa.go.jp/j_info/visit/visa/ for the latest guidance if you are in any doubt. Many JaLS students do not require a visa to come to Japan under the visa waiver program. In general, the longest you can stay without a special visa is 6 months out of a year (depending on your nationality). When you arrive in Japan, Immigration will check your passport and visa status, and will normally give you a 90-day landing permit. Available automatically for students from many countries. Available in some situations for students who are not eligible for the Visa Waiver Program. These visas are normally for no more than 90 days and we recommend visiting your local Japanese Embassy for more information. Available for students from Australia, New Zealand, Canada, South Korea, France, Germany, UK, Ireland, Denmark, Hong Kong, Taiwan, Norway, Portugal and Poland. This is a 1-year visa which allows you to work and study. It is possible, if your period of stay is of 90 days or less, to leave Japan once, return and be issued with a new visa waiver. It is legal to leave Japan once before your visa waiver expires and then return to Japan, receiving a second 3-month visa waiver. However, in these situations you may be selected for extra questioning by immigration and be required to present additional information to prove you are not committing crime, working illegally in Japan or overstaying. If you answer these questions honestly then you should have no problems. However, in the occasion that you are refused entry, Hokkaido JaLS cannot be responsible for additional charges or costs incurred, so please check with your own Japanese embassy if you have any other questions at all. Students coming to learn Japanese from countries not listed above can apply for a tourist or short-stay visa from the Japanese Embassy in their home country. Hokkaido JaLS can provide you with a letter of admission in order to assist with the application process. However, we are unable to become student guarantors. It is generally not possible to receive a tourist visa for periods of longer than 3 months, and we recommend applying to your embassy as early as possible, as in some cases the application process can take some time. Working Holidays Visas are available for a limited number of countries. 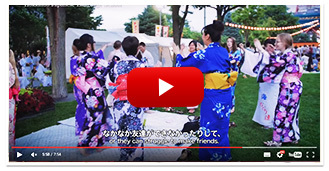 Working Holiday is a one-year visa designed to give young adults the chance to experience life in Japan. It gives them the right to study or work, as long as the job itself is not seen as the main purpose of their stay. The visa is only open to people up to 30 years old (or 35 in some countries), and you have to be able to show proof of minimum funds – usually about $2000 USD – as well as the money to buy a plane ticket back to your home country. If you need more information, ask the Japanese Embassy in your country, as application procedures vary. ~ If you are from a country listed under the visa waiver program, you don’t need to do anything before coming to Japan. Your visa waiver is automatic. ~ If you are from a country without a visa waiver, you must apply for a tourist or short-stay visa before coming to Japan. Procedures, required documents, and application deadlines vary from country to country and we advise that you contact your country’s Japanese Embassy for more details as early as you can. ~ If you are from a country with a 6-month visa waiver, no action at all is required before coming to Japan. Your visa waiver is automatic. When you arrive in Japan, you will receive a 90-day landing permission. At least a week before this expires, you must go to the Immigration Office to renew your landing permission. ~ If you are from a country with a 3-month visa waiver, you will have to leave Japan before the 90 day period expires. Upon reentering Japan, you should be eligible to receive a new visa waiver as detailed above. ~ If you are from a country without a visa waiver, you must apply for a tourist visa. However, it is very rare to be issued such a visa for more than a 3 month period. A special visa is required for stays of more than 6 months within a single year. Working Holiday visas can be used to study at Hokkaido JaLS and these visas will enable you to remain in Japan for up to a one year period. Unfortunately we are not able to sponsor student visas, so if you require this service we can put you in contact with an alternative language school.